Tennessee starts 11-0 in conference play for the first time in school history. KNOXVILLE, Tenn. — The no. 1 Vols pushed their school record winning streak to 19 games with a 85-73 win over South Carolina on Wednesday. Tennessee's (23-1, 11-0 SEC) versatility and depth offensively was on full display. Five Vols finished with double figures in points led by Admiral Schofield with 21. Schofield pulled down 10 boards to notch his fourth double-double of the season. 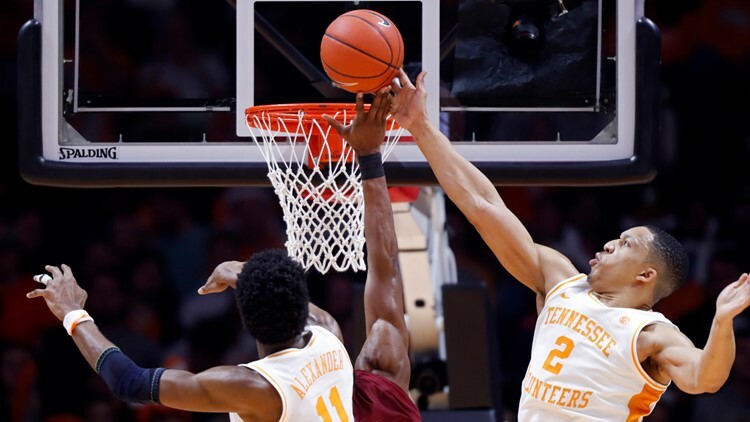 Reigning SEC Player of the Year Grant Williams was not one of the five in double figures, but he dished out a career-high-tying seven assists, scored eight points and grabbed nine rebounds. The Vols trailed 15-12 seven minutes into the game but four different Vols hit three-pointers and Kyle Alexander threw down two dunks to spark a 21-3 run and help Tennessee take a 13-point lead into halftime. Alexander was more involved offensively than he has been in any game this season, taking a career-high 11 shots. He scored 10 points on 5-11 shooting. "There's no question we're better when Kyle is playing his best basketball. There's no question that when he's at his best, we're going to be in it with most teams we play against always because of what he does and the way he always affects the game," Vols head coach Rick Barnes said. "You look at tonight, he's 5-of-11, and he probably should have scored a couple more. He got the ball knocked away from him. He looks for rebounds, he needs more of those. There's no doubt about it. Having him on the floor, we need him. He's the anchor of what we do, especially defensively." South Carolina hit a season-high 14 three-pointers, the most the Vols have allowed in a game this season. The Gamecocks shot 61% from beyond the arc. Tennessee previously hadn't allowed an opponent to shoot better than 48%. However, Frank Martin's group was just 12-40 from two-point range. "We've played enough basketball now to know that if you score a basket and jog down the floor, you let somebody get to the rim or get a step and get a great look at a three," Barnes said. "In the first half we were jogging back in transition. I thought we were celebrating, and that's not who we are to be honest with you. We addressed that at halftime. The fact that you have to play. It goes back to understanding that there's a lot of basketball left to play and that we can get better. You can never jog in this game, especially when you score." Now the Vols get ready for a top-five matchup against Kentucky at Rupp Arena, Saturday night at 8 o'clock.